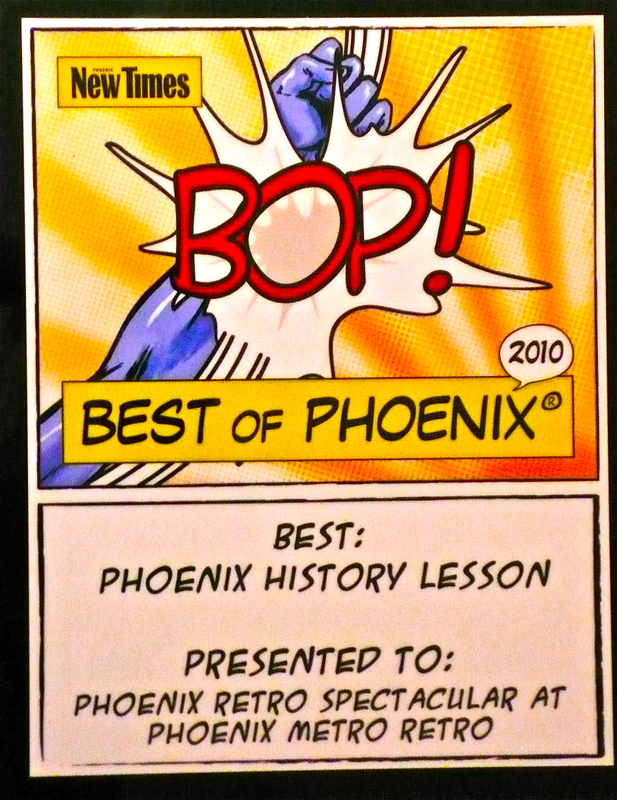 Thursday, March 10 @ 7p is the next Marshall Shore: Retro Spectacular at Phoenix Metro Retro (708 W. Hazelwood St.) Celebrations in the Valley will the featured topic. Clothing creates community connection "to a t"
Last week, Taz Loomans started a conversation about the wearable art I have been creating. The past several months I've designed a shirt a month using iconic images from the Valley's history. 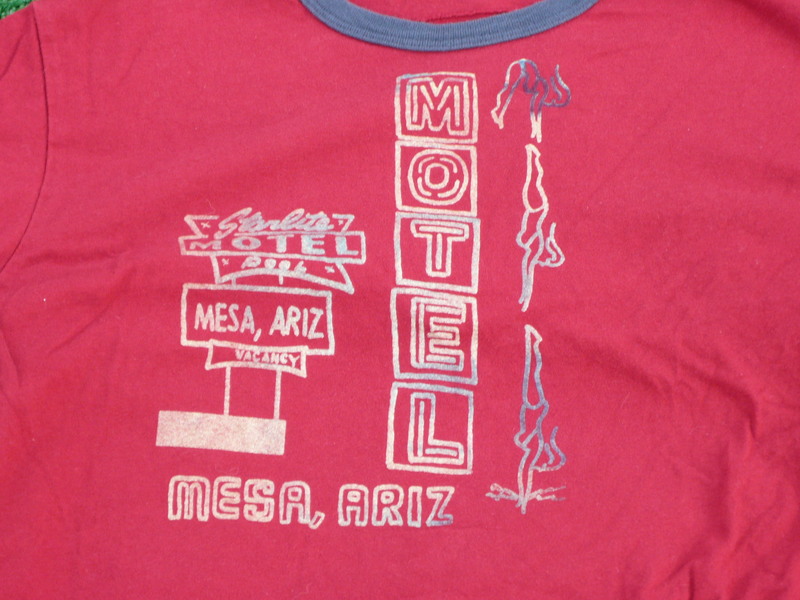 The art is custom one-of-a-kind drawn by hand, silk-screened individually, and the t-shirts/shirts are 100% recycled. The result is a unique work of art. I've been working on getting an Esty store up and running, but not yet. It will be called FoundAZ like my blog. 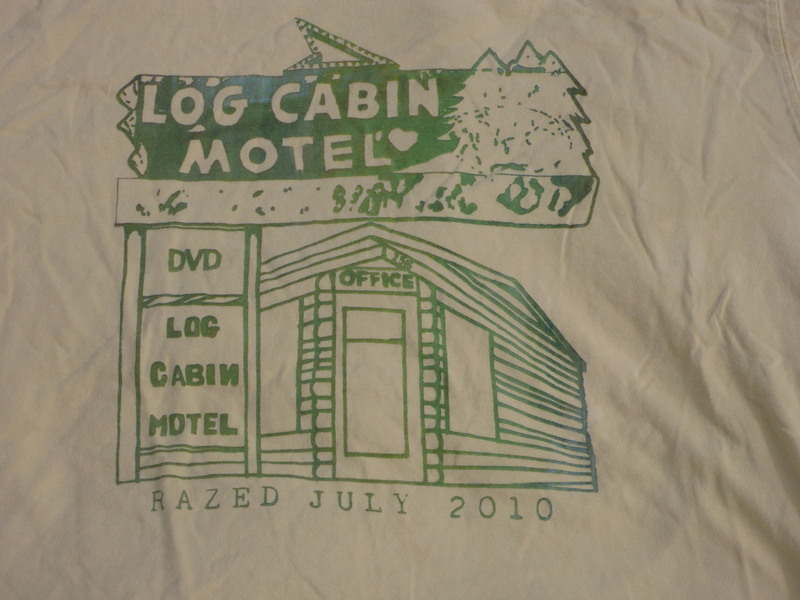 Log Cabin Motel was located on 24th St. and Van Buren, and demolished the summer of 2010. It was really the end of an era for Van Buren that at one time was filled with resorts and motels catering to travelers heading to Las Vegas, LA, or beyond. When it opened, it had a golf course and a large water wheel out front. It had declined and was the last hourly rate hotel in the city. The first couple buying this shirt told me about wearing them to a local diner. The waitress asked about the Log Cabin and they were able to tell her about it during a conversation that lasted quite sometime. Why just this weekend, while wearing this shirt, a woman told me about how her parents spent their honeymoon at the hotel. Neon Diving Lady at the Starlite Motel in Mesa. Probably, the most famous sign on Mesa's Main St. came down during a storm last October. The Mesa Preservation Foundation is trying to raise funds to get her diving for all to enjoy -- again. Bali Hi/ Grand Ave. Imagine back when Grand Avenue in Phoenix was filled with resorts and the automobiles most seen were Lincoln and Cadillac's. The Bali was an upscale motor court along Grand Ave., the epicenter of Phoenix Tiki culture directly across from the Bikini Lounge in an era that predated the interstate system. 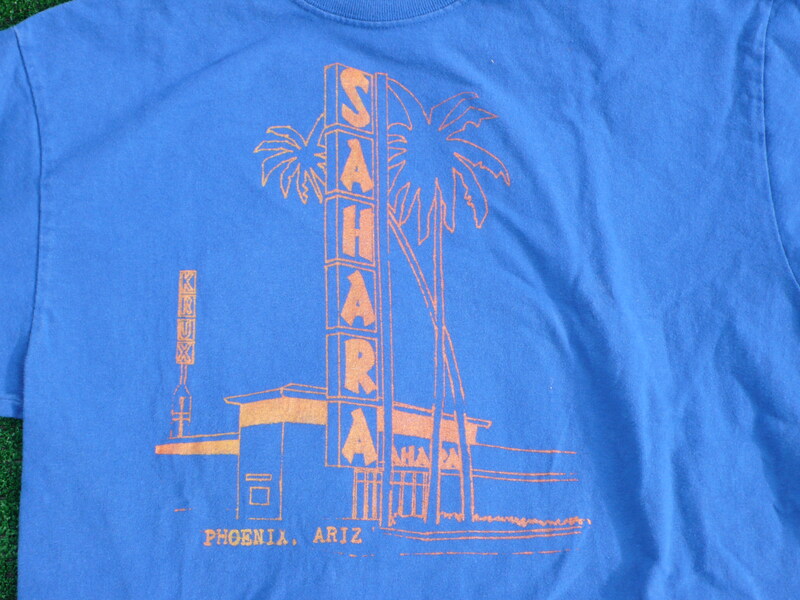 The Sahara Inn. While filming the movie "Bus Stop," Marilyn Monroe stayed in the penthouse of this fab hotel in the heart of downtown Phoenix. Most recently it was ASU student housing, but deemed by the City of Phoenix and ASU to be a safety hazard to be torn down to become a parking lot. A valiant attempt was undertaken by many downtown and community advocates to (a) save the building and (b) consider some portion of the one-acre parking lot to be a dog park. Alas, it was not to be (to the detriment of our downtown). Kon Tiki was a Ralph Haver designed hotel owned by Jay Newton of Beef Eaters on W. Camelback fame. Glen Guyett was the sign designer. It was briefly seen in the Morrissey video My Love Life. Long ago torn down, it still holds a place in local lore about how amazing it was in its hey day. "Be BOLD or move to suburbia" was the first t-shirt I created. Yuri Artibise posted this via Facebook from a Canadian condo marketing campaign. The moment I saw it I knew it was a slogan that needed to be in Phoenix. October 16, 1931! Yes, this is the 80th anniversary of one of the most sensational crimes in Arizona history. The infamous train trip (back when passenger trains came through the Valley) by Winnie Ruth Judd from Phoenix Central Station to LA with her two roommates. The roommates were in three trunks. You do the math. This t-shirt was created for the Trunk Space that for several years held Winnie Fest, including a screening of Winnie Ruth Judd- Murderess, a feature film done with vintage marionettes. "Glendale, The City of Modern Convenience," is from a 1926 ad promoting Glendale, Arizona (not California). The confusion is understandable with all those tall buildings. Glendale, Arizona did not look like this in the late '20's nor today... though it is quite convenient. What t-shirt art would you like to see designed and worn with pride?